Elizabeth Just Trusted in Jesus! Meet Rene and Elizabeth. Rene works at a building supply store and often drinks too much. When he drinks, he becomes very angry with his wife Elizabeth and their two teenage daughters. Elizabeth was ready to leave him earlier this year with plans to provide for her family through her sewing job in a local factory. 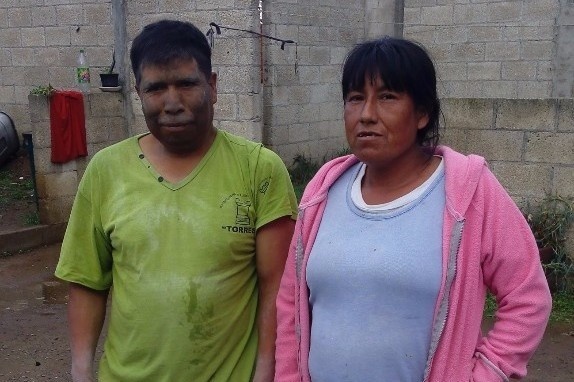 In June, Pastor Ramon Cancino and his church decided to engage with HOPE Coffee and share the gospel with someone in their community of Puebla Mexico. The members of the church were introduced to Rene and Elizabeth. Rene didn’t want anything to do with evangelical Christians. However, Elizabeth was willing to listen and mentioned their need of a roof. Pastor Ramon and his church began working in early August to build up the walls and put a new roof on their home. This was slow work that required several weekends of working alongside the family. Each weekend Rene, Elizabeth and their two girls heard more about the gospel message as they worked, and this family saw the love of Jesus Christ demonstrated. On Tuesday, August 22nd, as the work was continuing, Elizabeth chose to place her faith and trust in Jesus Christ! She asks for prayer for her husband Rene that he too would trust in the message of the gospel of Jesus Christ. 1 Corinthians 3:6-9 I planted the seed, Apollos watered it, but God has been making it grow. So neither the one who plants nor the one who waters is anything, but only God, who makes things grow. The one who plants and the one who waters have one purpose, and they will each be rewarded according to their own labor. For we are co-workers in God’s service; you are God’s field, God’s building. Thank you for being co-workers with us in God’s service!